Schematic depicting a potential application of this mechanically and thermally stable nanocrystalline Cu-Ta-alloy that exhibits unprecedented property combinations i.e., high strength with extremely high temperature creep resistance. The property combinations stem from the effect of processing which creates a unique microstructure comprising of distinct GB-pinning nanoclusters that favor the retention of nano-sized grains under extremely long-term creep conditions. 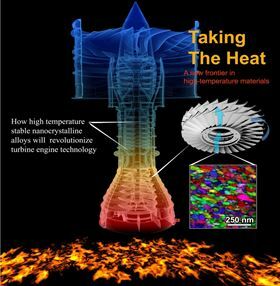 The findings hold promise as the high temperature stable nanocrystalline Cu-Ta alloys will someday revolutionize the turbine engine technology. Gas turbines operate at extremely high temperatures so the metals and alloys from which they are constructed must possess a unique combination of mechanical strength and resistance to creep. This slow irreversible deformation process of materials under longterm mechanical stress is a particularly pernicious problem. Now US researchers have developed a nanocrystalline Cu-Ta alloy with a combination of high mechanical strength and high-temperature creep resistance [Darling et al., Nature (2016), doi: 10.1038/nature19313]. “Nanocrystalline materials have greater room-temperature strength than their coarse-grained equivalents [but] are unstable at high temperatures and have never been considered viable for high-temperature applications,” explains Kiran N. Solanki of Arizona State University, who led the study. The team from the Army Research Laboratory in Maryland, Arizona State University, and the University of North Texas, however, has created a nano-grained material with very high temperature stability comparable to single-crystal Ni-based superalloys using a high-energy ball milling process followed by repeated extrusion. The alloy is made up of nanocrystalline grains of Cu and Ta, with the latter component varying in size from atomic clusters to larger particles. The researchers believe that it is nanoclusters of Ta that are key to the alloy’s remarkable properties. It is these processes that are responsible for grain coarsening and creep under long-term mechanical stresses. The new alloy has a creep rate six to ten times lower than typical nanocrystalline metals at temperatures of around 600 degrees C. Although this is less than the 1000+ degrees C temperatures that defect-free Ni-based superalloys can withstand, the researchers believe their findings will open the way to new metallic materials that can operate at higher temperatures and stresses. The researchers are now investigating other alloys based on Ni and Co using the same processing technique.